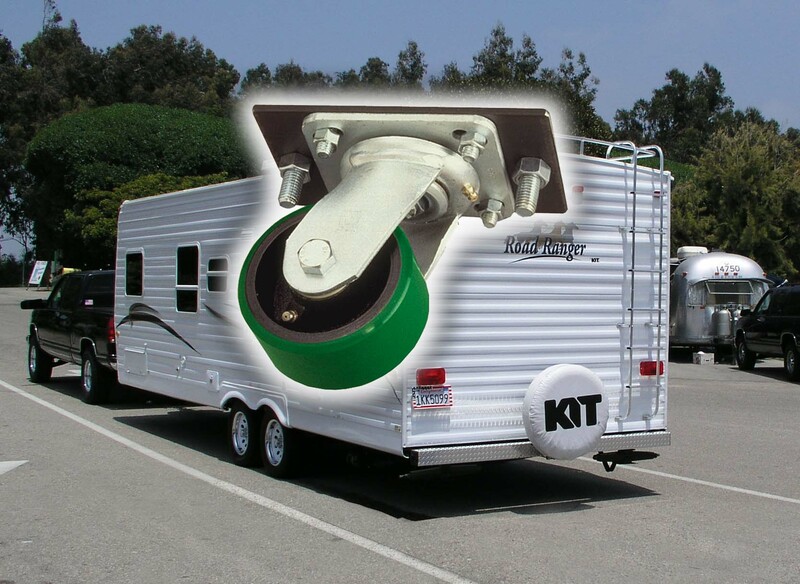 Everything on this page will fit your motorhome! These are our strongest Hitch bar mount skid wheels. 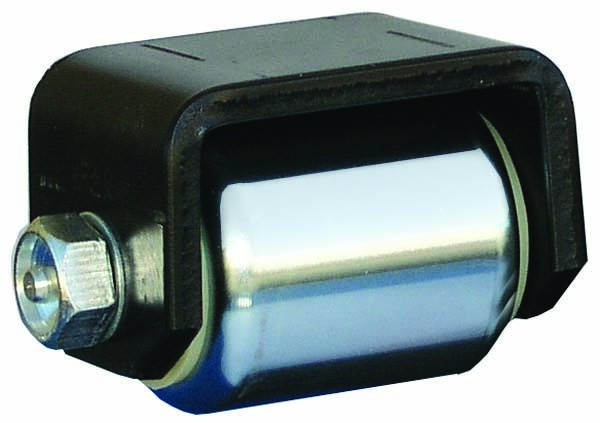 3" x 2-3/16" wheels are machined out of solid steel, with roller bearings and grease fittings for easy lubrication. Tough enough to be used on the largest and heaviest motorhomes. Total height measures 3.5" from the top of mounting plate to the bottom of the wheel. 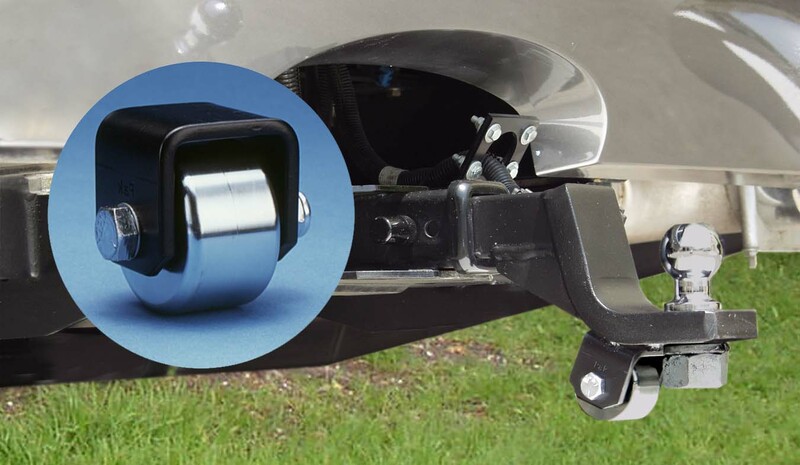 Spacer kits to extend the length of both hitch bar mount skid rollers are available. For hitches that have receivers welded to the bottom of the hitch bar the spacers can be bolted between the roller assembly and the bar. 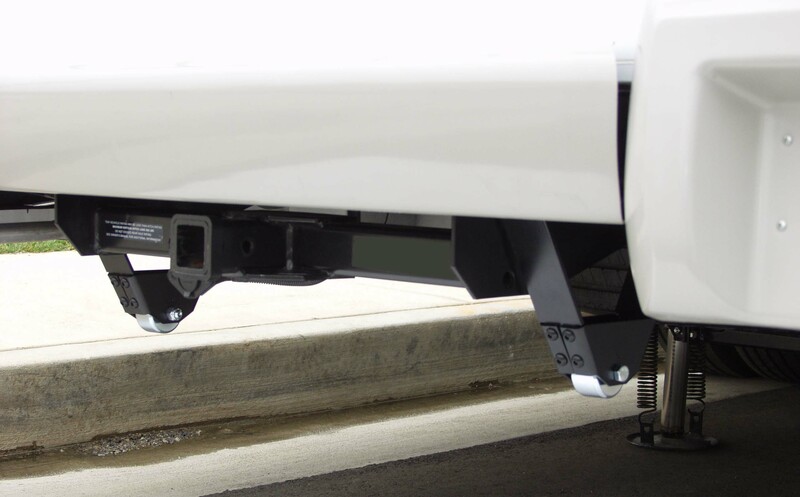 This lengthens the skid wheel assembly so that it hangs down lower than the hitch. Drops the wheel down an extra 2.25" for a total height of 5.75" from the bottom of the hitch bar to the bottom of the wheel. 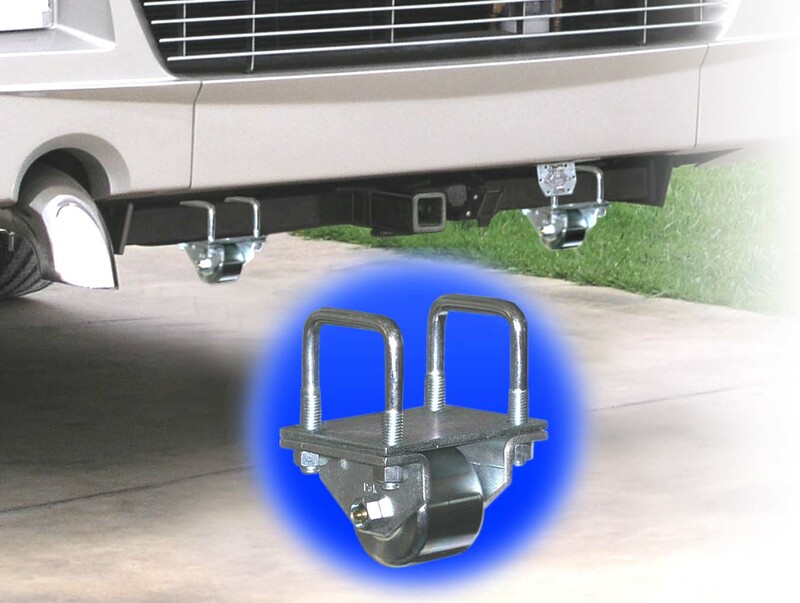 Spacer kits contains spacers, plates, and hardware for one pair of hitch rollers only! The parts are shown in red. Replace old worn Skid Bars with "New Roller Skid Bars"
2.5" x 1.5" wide solid steel wheel with .5" diameter hardened steel axle (no bearings). 3" x 2-3/16" wide solid steel wheel with roller bearings, grease seals, and zerk axles for easy lubrication. 3" x 2-3/16" wide solid steel wheel with roller bearings, grease seals, and zerk axle for easy lubrication. Total height measures 3.375" from the top of mounting plate to the bottom of the wheel. The Micro is Paktron's lowest profile roller. Ideal for any low vehicle of any size or type. This 2" x 2" solid steel wheel has a hardened steel spanner bushing, zerk axel, and grease seals to keep grease in and dirt out. Total height measures 2.375" from the top of the mounting plate to the bottom of the wheel. 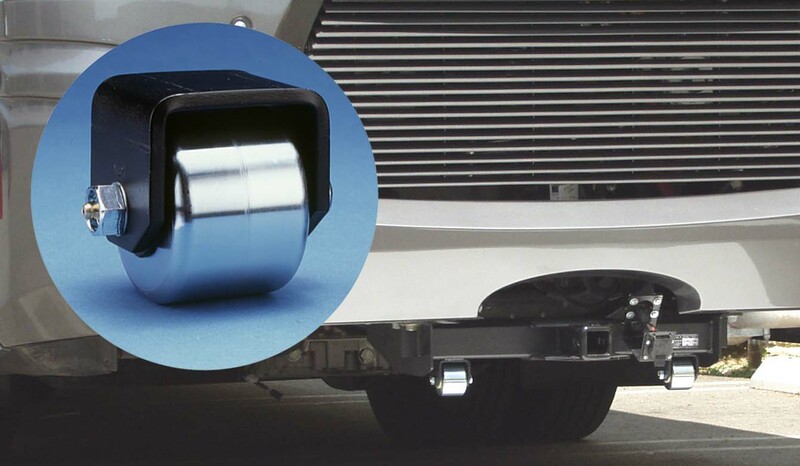 The mini is an economy roller and is ideal for drop hitches and skid bars. 2.50" x 1.50" wide solid steel wheel with .50" diameter hardended steel axle (no bearings). Total height measures 2.875" from the top of mounting plate to the bottom of the wheel. 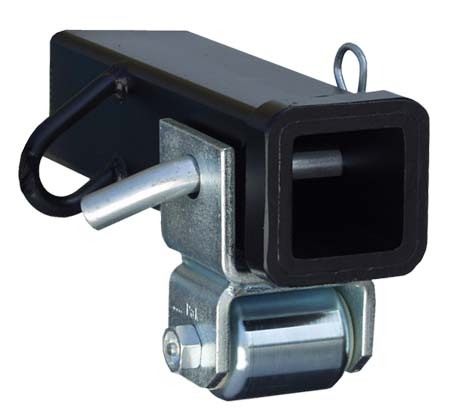 This item protects the receiver and hitch post from road damage. Receiver and hitch pin are NOT included. 2.50" x 1.25" solid billet steel wheel. For older models which had plastic wheels, there is a replacement wheel/ upgrade kit available containing the steel wheel, heavy duty axle bolt, washers and lock nut. Hitch protector with 2" x 2" solid steel wheel. Held on by a regular hitch pin (not included). Also can be used while towing. Wheel has a hardened steel spanner bushing, zerk axle and grease seals to keep grease in and dirt out. 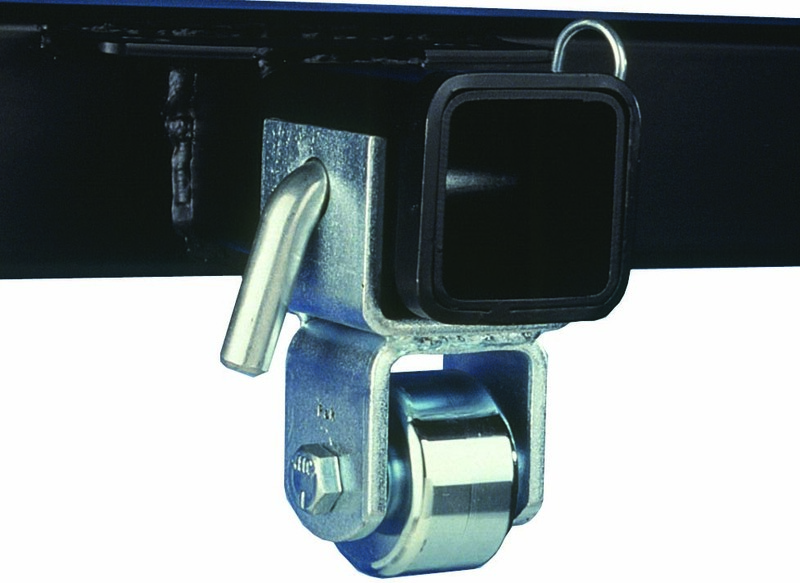 Rigid steel universal caster fits both 2.5" and 3.5" hitch bars. 4"x2" metal wheel with a 1/4" tough urethane outer edge. Includes mounting brackets and hardware. Ideal for motorhomes up to 30ft. 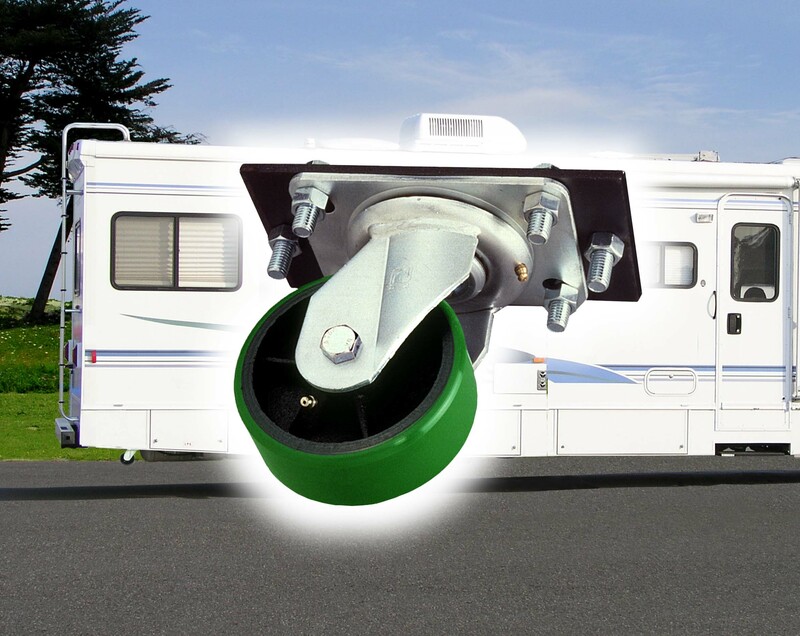 Replacement wheels available please see the "Additional RV Products" page for details. 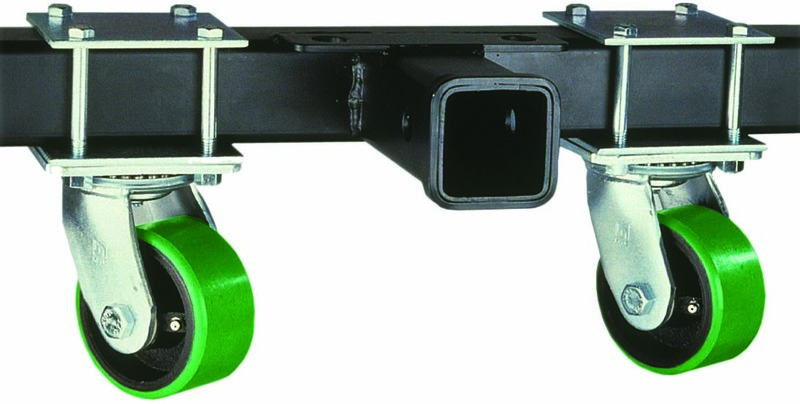 Swivel, hitch mount casters fit 2.5" hitch bars only. 4"x2" metal wheel with a 1/4" tough urethane outer edge. Includes mounting brackets and hardware. Ideal for motorhomes up to 30ft. Great for the largest and heaviest front engine motorhomes and trailers. Massive drop forged steel swivel caster. 6" x 2" metal wheel with a 1/4" tough urethane outer edge. Includes mounting brackets and hardware. 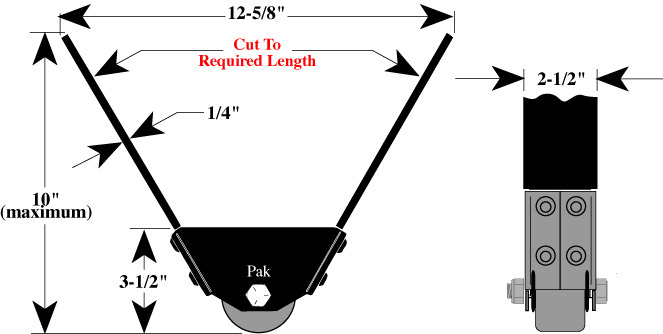 Total height measures 7.50" from the top of mounting plate to the bottom of the wheel. The weight capacity is 2,500 Ibs per wheel. 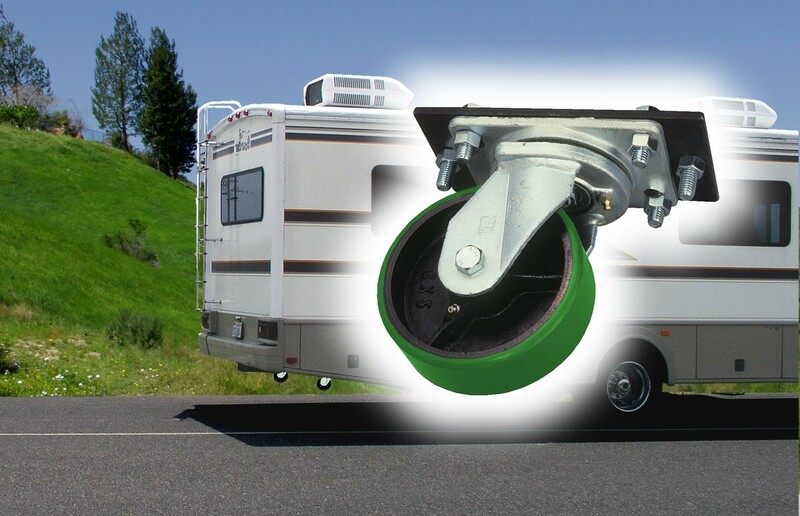 Excellent for front engine motorhomes and trailers up to 34 ft. Large cold forged steel swivel caster. 5" x 2" metal wheel with a 1/4" tough urethane outer edge. Includes mounting brackets and hardware. Total height measures 6.75" from the top of mounting plate to the bottom of the wheel. The weight capacity is 1,500 Ibs per wheel. Ideal for low profile front engine motorhomes and trailers up to 30 ft. Cold forged steel swivel caster. 4" x 2" metal wheel with a 1/4" tough urethane outer edge. Includes mounting brackets and hardware. Total height measures 5.75" from the top of mounting plate to the bottom of the wheel. The weight capacity is 1,500 Ibs per wheel. 5th Wheel and Travel Trailer up to 30 ft.
5th Wheel and Travel Trailer up to 34 ft.
5th Wheel and Trailers over 34 ft. Copyright © 2007 Featuring. All Rights Reserved. Designed by Free CSS Templates.